(Nanowerk News) Scientists at the Department of Energy's Oak Ridge National Laboratory have created a recipe for a renewable 3D printing feedstock that could spur a profitable new use for an intractable biorefinery byproduct: lignin. The discovery, detailed in Science Advances ("A path for lignin valorization via additive manufacturing of high-performance sustainable composites with enhanced 3D printability"), expands ORNL's achievements in lowering the cost of bioproducts by creating novel uses for lignin--the material left over from the processing of biomass. Lignin gives plants rigidity and also makes biomass resistant to being broken down into useful products. "Finding new uses for lignin can improve the economics of the entire biorefining process," said ORNL project lead Amit Naskar. The work is tricky. Lignin chars easily; unlike workhorse composites like acrylonitrile-butadiene-styrene (ABS) that are made of petroleum-based thermoplastics, lignin can only be heated to a certain temperature for softening and extrusion from a 3D-printing nozzle. Prolonged exposure to heat dramatically increases its viscosity--it becomes too thick to be extruded easily. But when researchers combined lignin with nylon, they found a surprising result: the composite's room temperature stiffness increased while its melt viscosity decreased. The lignin-nylon material had tensile strength similar to nylon alone and lower viscosity, in fact, than conventional ABS or high impact polystyrene. The scientists conducted neutron scattering at the High Flux Isotope Reactor and used advanced microscopy at the Center for Nanophase Materials Science--both DOE Office of Science User Facilities at ORNL--to explore the composite's molecular structure. They found that the combination of lignin and nylon "appeared to have almost a lubrication or plasticizing effect on the composite," noted Naskar. "Structural characteristics of lignin are critical to enhance 3D printability of the materials," said ORNL's Ngoc Nguyen who collaborated on the project. 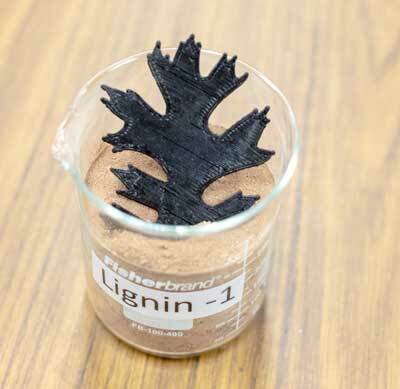 Scientists were also able to mix in a higher percentage of lignin--40 to 50 percent by weight--a new achievement in the quest for a lignin-based printing material. ORNL scientists then added 4 to 16 percent carbon fiber into the mix. The new composite heats up more easily, flows faster for speedier printing, and results in a stronger product. "ORNL's world-class capabilities in materials characterization and synthesis are essential to the challenge of transforming byproducts like lignin into coproducts, generating potential new revenue streams for industry and creating novel renewable composites for advanced manufacturing," said Moe Khaleel, associate laboratory director for Energy and Environmental Sciences.